Stair lifts are an excellent way to make the lives of the handicapped easier, whether they are confined to a wheel chair or simply unable to scale the stairs a handicap stair lift is an excellent solution. 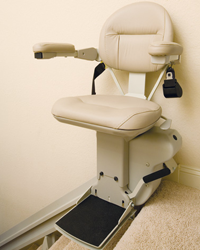 If you are handicapped and wish to bring a great deal of ease to your life consider adding a stair lift to your home. A stair lift can grant you a new found independence in your home as you will be able to scale the stairs without the assistance of others. If you currently reside in a one story home and have always dreamed of relocating to a multiple story home but you refrained because of your handicap start looking for your dream house and just have a stair lift or two installed before the move. Stair lifts, when they are sold and installed by a reputable supplier, can grant you or a loved one a new sense of independence. Whether you are in a wheel chair or can’t climb the stairs for other reasons there is the right stair lift for you out there – it is just a matter of finding it. If you are in a wheel chair then you are going to want to purchase a stair lift that is a platform that you can easily roll on to; if you are able to walk but unable to climb stairs then a stair lift with a seat, arm rests and a safety belt is going to be the right choice for you. Whether you need a stair lift on the exterior of your home to get up to your deck, a single straight lift for one story of your one, or an elaborate curved stair lift for your multiple story home you will be able to find the right stair lift for your home with us. Different types of stair lifts, such as straight versus curved, will take different lengths of time to complete but in the end they will provide an excellent service that you are sure to use for years to come. When you have your stair lift installed in your home to accommodate your needs it is important that it is installed by a professional to guarantee the greatest safety. Installation experts have been trained to properly and securely install your stair lift to ensure that your lift will work and charge properly and last for years to come with the correct maintenance.